Time for a fall party! This adult beverage is so easy to make and so delicious. 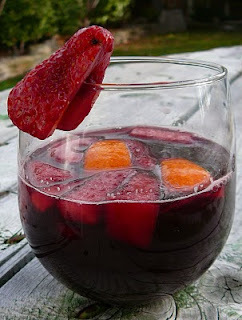 You can use fall fruits and the red wine of your choice to really make it "your own". Although some alcohol (ethanol) may have heart-healthy benefits, it can also add liquid calories to your diet, especially when that alcohol is mixed with sugar, soda, or juice. Moderation, moderation, moderation!! Combine fruit, wine, Triple Sec, lemon juice, orange juice, and sugar in a large pitcher. Allow to sit overnight. Prior to serving, mix in seltzer water. Pour sangria over ice in glasses and top with a scoop of marinated fruit.